These were the words of Martin Visser, a House Committee member of Helshoogte, as he was painting at the Ida’s Valley sportsgrounds during the MAD² Community Interaction morning on Friday, 1 February. The Community Interaction morning formed part of MAD² (Making A Decision 2 Make A Difference). MAD² is a student-driven fundraising effort which includes several opportunities to raise funds for Matie Community Service (MCS). Residences and private wards also use this interaction morning to introduce their annual community engagement project to their residents. 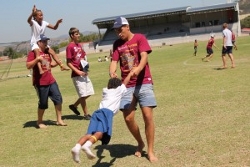 Friday’s events included reading programmes, sports activities, painting and gardening at several schools in the area. 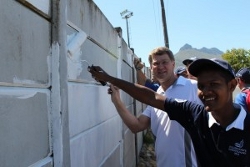 A number of residences painted a 300m wall at the Idas Valley Sports Grounds, Libertas and Huis Ten Bosch presented a life skills and sports day at Cloetesville Primary, Helshoogte and Vesta played mini-cricket at Pniel Primary, Minerva and Pieke planted trees in Kayamandi, while students at the Tygerberg campus worked at schools in the Delft area. At St Idas Primary in Ida’s Valley students from Olympus and Equité painted classrooms and did some sport activities with the learners. “It is fantastic that young people from the university become involved with schools in the community, especially since the children see them as role models,” said Mrs Glynis Rippenaar, principal of St Idas. “We have one of the best tertiary institutions on our doorstep and the integration is wonderful,” she added.